Kampala — Uganda yesterday accused Rwanda of engaging in a trade war by employing non-tax barriers to block Uganda exports and to prevent Rwandans from exporting to Uganda. Uganda's Foreign Affairs Minister, Mr Sam Kutesa, in a statement issued yesterday noted that "Rwanda has introduced an export permit system for those that intend to export goods to Uganda." "This is a technical and non-tariff barrier to trade, to which there has been no successful applicant. This is a trade embargo on bilateral trade with Uganda," the minister noted in one of the most explicit condemnation of Rwanda's action by a highly-placed Ugandan official. Rwanda shut its busiest border post at Gatuna to commercial vehicles from Uganda at the end of last month on the pretext that it was building a one-stop border post on its side. 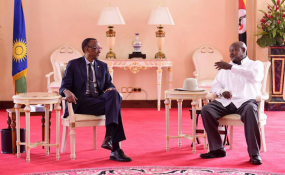 Hours later, its Foreign Minister Richard Sezibera claimed in tweets that Uganda harboured dissidents plotting to destabilise President Paul Kagame's government. He also banned Rwandans from traveling to Uganda, citing ever-present danger of their arrest and incarceration. Uganda rebutted the allegations point-by-point as things Rwanda "knew well" to be lies, but said little else. The inter-state traffic has been diverted through Mirama and Kyanika/Cyanika and minister Kutesa yesterday reported that Ugandan customs officials have, since February 28 when Rwanda closed its Gatuna border, cleared 437 mainly light vehicles. "What is, however, happening on the ground is that export of Ugandan goods to Rwanda have been prohibited by Rwanda authority. The same authorities are only allowing crossing into Rwanda [of] those trucks carrying transit goods destined for Rwanda or transiting through Rwanda to [the] Democratic Republic of Congo and other places. Goods from Rwanda and Rwanda-registered trucks are not being allowed to cross over from Rwanda into Uganda by the Rwanda authorities" Mr Kutesa noted in yesterday's statement. Traders plying the routes last evening said all imports into Rwanda were being first taken to a central store in Kigali for additional verification, and the exercise could last a day or longer. Rwanda's Foreign Minister Sezibira was yesterday inaccessible when we tried reaching him by telephone. In Kampala, Maj Gen Frank Mugambage, the Rwanda ambassador to Uganda, said by telephone that "I am not available". Uganda last year exported $250m (Shs926b) worth of goods to Rwanda, nearly twelve times higher than the $20m (Shs74b) worth of imports from Kigali. Mr Vincent Seruma, the Uganda Revenue Authority spokesman, said last evening that Rwanda's February 28 border shutdown had not affected revenue collection because Uganda continued to clear and pick taxes on exports. "There is no revenue lost... we have been clearing the goods on our side and Katuna/Gatuna is not the only border post," he said. Kenya's Deputy President William Ruto, during a visit to Kampala on Tuesday, slammed Rwanda's protectionist move and described its border blockade as "retrogressive" for the East African Community (EAC). The EAC protocol, which binds all the six member states, provides for removal of technical and non-tax barriers and free movement of goods and services within the region as its cornerstone. Dr Libérat Mfumukeko, the EAC secretary general, on a visit to Uganda yesterday, told this newspaper that the bloc's secretariat in Arusha, Tanzania, is trying to resolve the stand-off through diplomatic channels. "We are talking about six different countries with different backgrounds and issues. Don't expect this to be a light work," he said, "Our technical teams now are looking closely at the situation and I will have a report on this issue very shortly and then engage the partner states to resolve this problem," he said. Asked if Rwanda's border closure amounted to a trade embargo as Uganda alleged, Dr Mfumukeko said they are yet to receive any such formal protest and "we don't know of any embargo imposed on Ugandan exports." "It is not in the interest of anyone to have the border closed anywhere in the EAC. It is in our interest to have free movement of people and goods across the EAC and that is the EAC spirit," he said. The issues that triggered the stand-off, he noted, are being dealt with by the technical people who interact with seniors in respective countries. "... we do not feel that we are just watching, but we have our ways of dealing with it technically and diplomatically," he said of a row that analysts say tests the resilience of the EAC to rein in errant behaviour by member states. President Kagame is the bloc's current chair and succeeded President Museveni, with whom he is feuding.